8000FFFF: It is a Windows update error which indicates the update is being blocked. 0x80004005: This error will prompt that Windows Live Movie Maker has had to restart unexpectedly. You can try to get over it by applying some updates, namely, installing the Windows-update KB2990967, KB2984006 or KB2998527. 0x80070057: The issue may be caused by incompatible or corrupt source files. To avoid this, please try to import the most suitable file formats for Windows 10 Movie Maker, such as WMV as the video format, WMA and WAV as the audio formats and BMP and JPG for photo importing. Those are natively supported by Windows Live Movie Maker on Windows XP, Windows 7, 8, 8.1 and 10. Many other video audio formats are reportedly friendly with the Windows video editor tool that is included in Windows Essentials Software suite. But the fact is you still have to convert some not-so-incompatible media files to the native media formats supported by Windows (10). It help you convert MKV, M2TS/MTS, FLV, MOV, MOD, TS, ASF, MOD, TOD, H.265, H.264, VOB, MPEG to WMV/MP4/AVI videos and so on for Windows Live Movie Maker to totally avoid incompatible errors. It also converts videos to WMA or WAV audio format. 100% compatible with any Windows OS. How to Fix Common Windows Movie Maker Errors on Windows 10? Movie Maker can't start/won't open: When you have encountered Windows Movie Maker error in opening, before restarting the movie maker, please ensure that your computer can meet the minimum system requirements. If failing again, try to update the driver for your video card: check at first whether it is the latest video drivers installed on your Windows system. For computers of different brands, you can get the latest drivers from different system manufactures. Press the Windows + R keys on the keyboard to open the run window, then typing dxdiag and clicking ‘ok'. Compare these with the info provided by the manufacturer's website. Windows Movie Maker Stop working：You can solve the issue whenever there is an error message "Windows Movie Maker does not start" by avoiding installing the incompatible video filter. If there already some, just run Windows Movie Maker in Safe Mode such that the incompatible video filter is not loaded. It can effectively settle the matter that WMM has stopped. 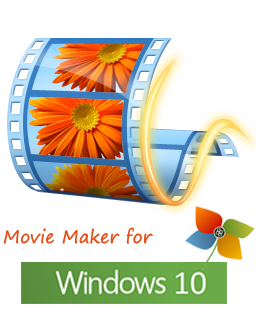 If your issues still cannot be fixed by the solutions above, or Windows Movie Maker will not work with/compatible with Windows 10, Windows 8 or 8.1, it's really the time to find a Windows 10 Movie Maker alternative. For example, someone is trying to making a movie maker based on VLC. The main features of Windows Movie Maker for Windows 10 is to add videos and photos, add music, record Webcam video, make snapshot. You can also add a new title before the selected item, add text/caption and add credits. As for animation effects, it enables you to create Transitions like blur, flip, pixelate, crossfade and cinematic, as well as edit visual effects, change aspect ratio, and so on. 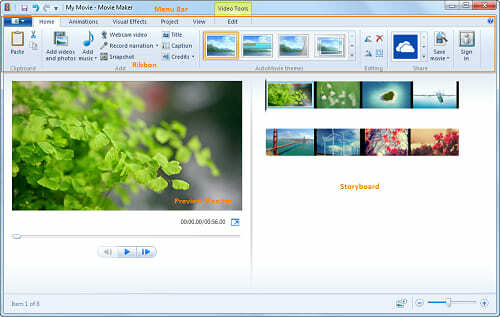 Some users only use Movie maker for a few basic features like trimming. In fact, these can be better realized by WinX HD Video Converter Deluxe. As a professional video converter though, it is built-in with photo/image slideshow maker, which can edit photo slideshow videos and turn your photos into movie(s). 1. You can add more than one image folders at one time and merge them, set time interval, add background music to your movie. 2. You can use WinX HD Video Converter to convert your movie to WMV, AVI, etc, or change to iPhone, iPad, Android, PSP accepted formats, or make it uploadable to YouTube, Facebook, Email and so on. 3. The editing function enables you to trim, crop and edit your movie videos. You can even add an external SRT subtitle to the movie. 4. If you are have a Mac computer, you can use the HD Video Converter for Mac to record camera videos or Mac screen before editing and converting the movie. No matter your movies are made by what movie making software, you can use WinX HD Video Converter (for Windows/10 and for Mac) to convert the movies to any other video audio formats, make them compatible with any mobile devices or big-screen TV, or facilitate the uploading of movies to YouTube/Facebook or sharing with your friends via Email. It can create photo slideshows, meaning that you can shoot Graduation Slideshow, make wedding slideshow with music, edit videos and convert mobile 3GP videos, JVC/Sony/Panasonic/Canon HD camcorder Videos (.mod, .tod, .mts, .m2ts, etc). It is perfectly compatible with all Windows Oss, from Microsoft® Windows 98 to Windows 10. I made a movie in Windows Movie Maker, and I wanted to convert it to WMV so I can upload it on YouTube or watch it in Windows Media Player. WinX HD Video Converter helped me a lot. Really grateful! Best 5 Free Windows 10 Video Editors - Crop, Trim, Merge, Compress, etc.